← Brands Hatch: Lotus 60, Elan 50. There were numerous Sports and Saloon Car teams that raced in the UK during the 50’s and 60’s. Aside from the principal works teams such as Lotus and Ford, there were the de facto works teams like Chequered Flag, Alan Mann, and of course Ian Walker Racing. 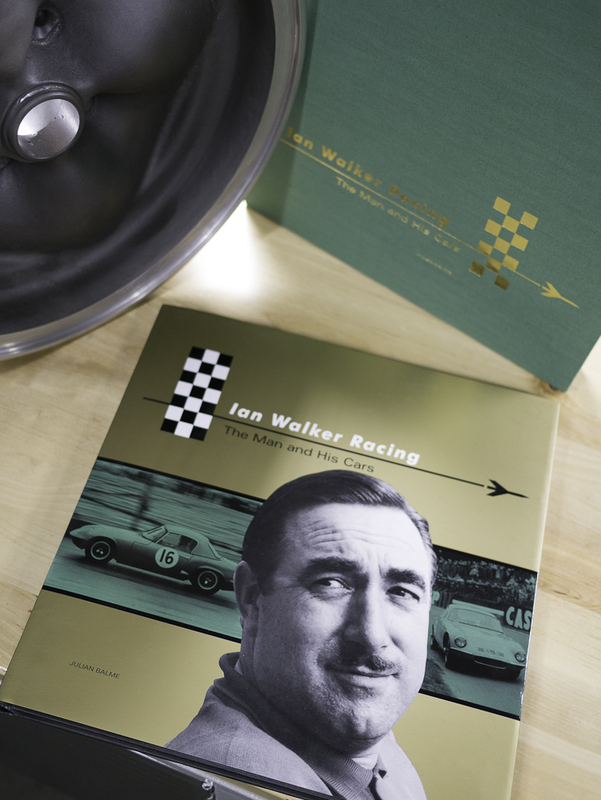 Coterie Press, known for their brilliant gallery quality books covering very specific automotive topics including many Lotus titles, has just released a new 208 page large format masterpiece on Ian Walker. The book, Ian Walker Racing , The Man and His Cars, covers his passion and success in racing . I have several books in my collection from Coterie Press and they are always presented in amazing quality and style and the new book on Ian Walker follows in similar fashion. Quality books that cover niche subjects are a serious undertaking. Researching the topic for accuracy can be daunting task and combing through collections for long lost photographs can take years. Fortunately, in the case of this book, the author has succeeded in both accounts and should be applauded for his effort. 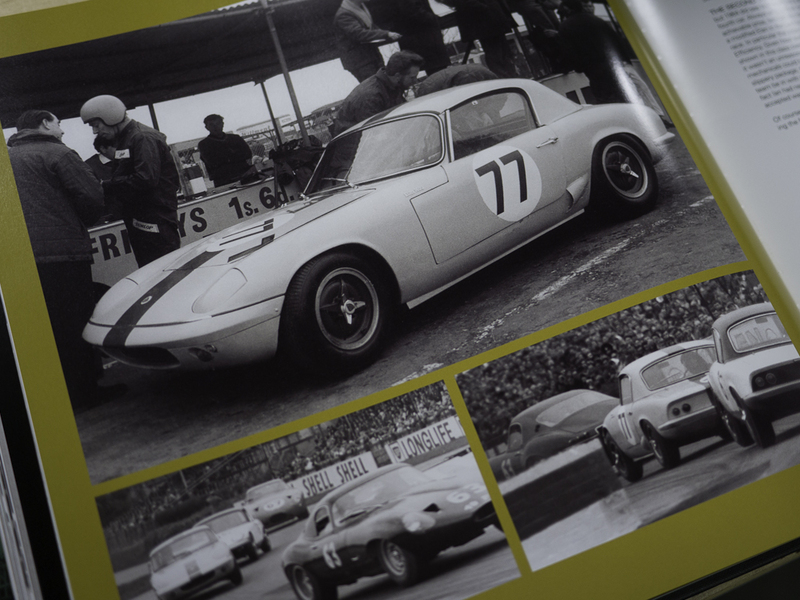 Ian Walker Racing – Early Elan Racing is covered in the book. 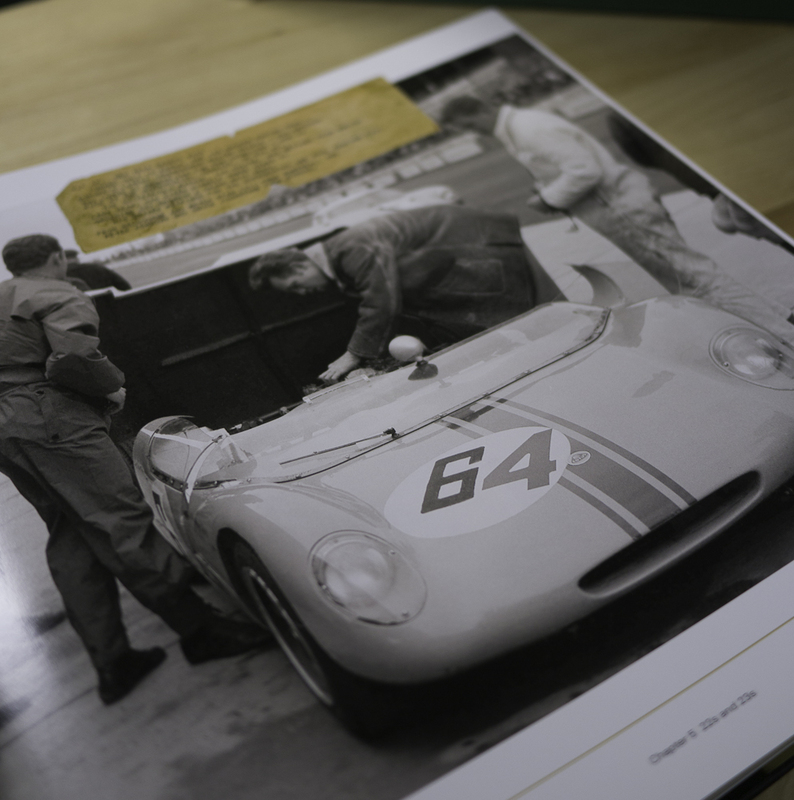 Ian Walker Racing – Detailed descriptions of many the team’s cars are found in the book. The Ian Walker story is filled with many details and interesting facts. The source of the airplane found in the team logo is even disclosed…but you will need to buy the book for the reveal. I enjoy detailed information and photographs and this book is filled with both. I recently had the pleasure of photographing the Ian Walker Racing Le Mans Coupe in detail at the Shelsey Walsh Hill Climb. 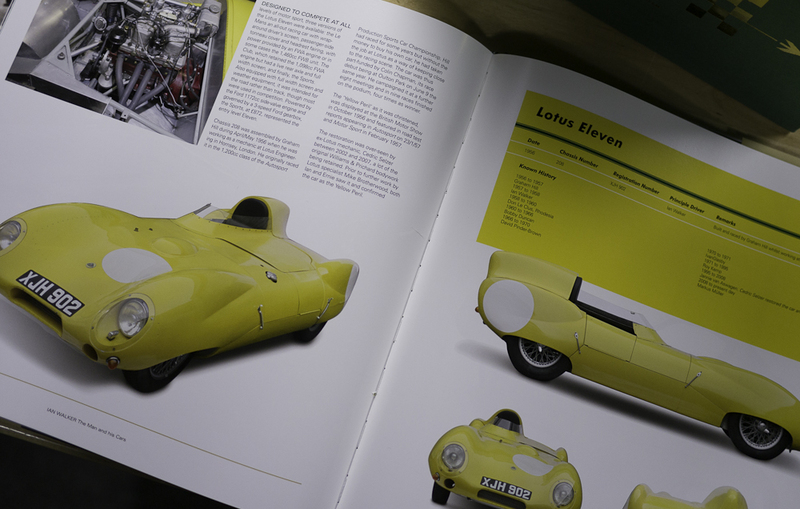 The gold Lotus is a work of art, and I was delighted to see a full range of meticulous images of the car included in the book along with technical details describing the specification of the racer. The detailed theme pleasantly carries through the entire book along with countless rich photographs. While Ian Walker Racing was considered the Lotus works “B” team, they also raced saloon and rally cars and the book covers them all. Ian Walker Racing – Rich images throughout. Ian went on to offer performance parts through Ian Walker LTD and established other businesses throughout his life. Ian Walker Racing The Man and His Cars will appeal to anyone interested in the relaxed racing scene of the 50’s and 60’s and anything associated with Lotus. The book is an excellent value and will be enjoyed for both entertainment and reference for many years. I purchased my copy directly from Coterie Press and you can order yours here. 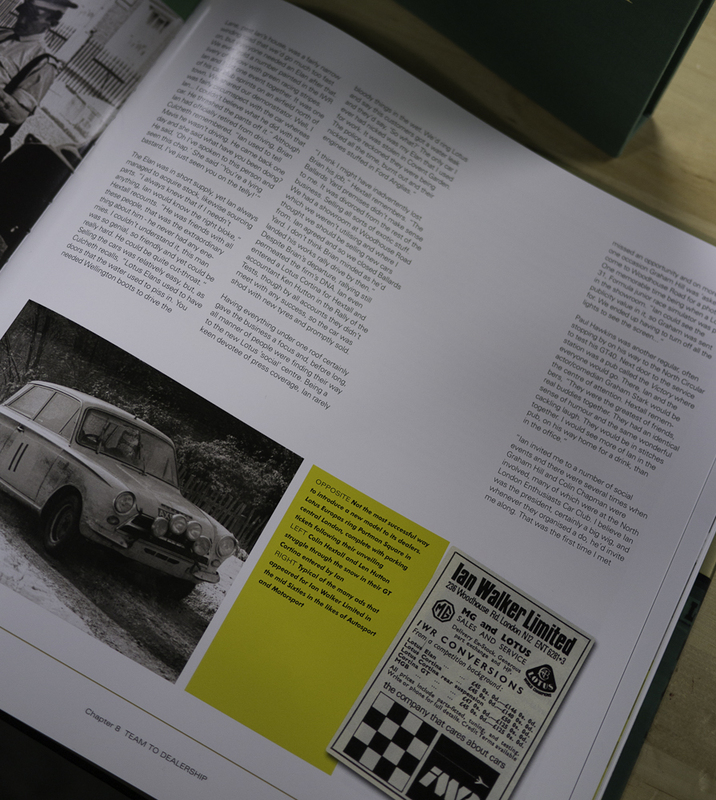 Gallery | This entry was posted in Books and media, Colin Chapman, Lotus, Lotus Cortina, Lotus Elan and tagged Elan 26R, Historic Racing, Ian Walker Racing, Lotus, Lotus Elan. Bookmark the permalink.